This is one of my favorite soups that brings out the Italian in our family. 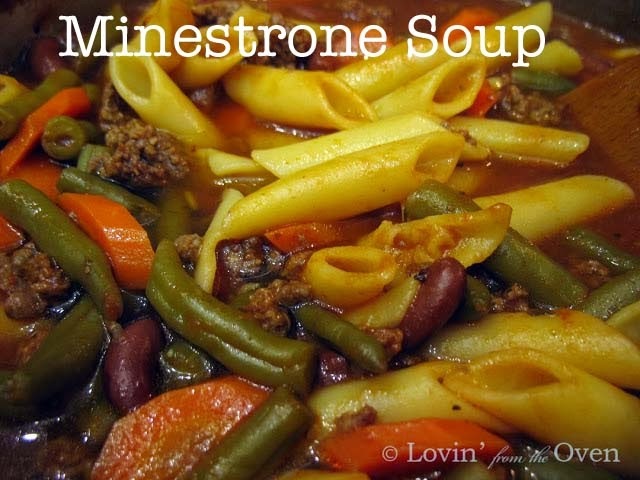 My kids make fun of how I pronounce it "minestronee." The Italian side is my hubby's not mine! This soup is chock full of veggies, noodles and beans swimming in a flavorful tomato broth. This recipe came from a friend of a friend and we have made it several times since! This recipe makes a LOT of soup, so plan to share with others or have leftovers. TIP: I have frozen it with good results. Just take your favorite soup bowl, line it with plastic wrap and freeze your soup in it. Then transfer the frozen soup into a freezer Ziploc, squeezing as much air out of it as you can, and store it up to 3 months. Brown the beef, onion, and celery. Add tomatoes, water, broth, carrots and seasonings; bring to a boil and simmer 20 minutes. Add the beans and macaroni and cook an additional 15-20 minutes, until the macaroni is tender. Your soup looks awesome! Thanks for the great tip on freezing soup! Yummmm! THIS looks SO good! I am going to try cooking it tonight! The other night, we had all of the YM at our apartment playing games and watching movies. I made your chocolate chip cookie recipe. I have never received so many compliments over cookies! So, really, all that thanks goes to you! Love you!!! Julie, this is a good soup. Warning, though...it makes a LOT! So invite those YW and YM over for soup and bread!